The Income Tax Department has slapped a fine of Rs 436.80 crores on New Delhi Television Limited owned by Pranay and Radhika Roy. This fine was slapped for the assessment year 2009-2010. According to reports, The IT department had served the order on 31 January under section 271(c) of the Income Tax Act. NDTV in a letter to BSE Ltd has confirmed the same. In the letter, NDTV has said it is currently examining the letter and exploring legal options available to them and they will take necessary actions accordingly. It should be noted here that section 271 (c) of The Income Tax Act provides for levying penalty on a company or individual if they have concealed income particulars or provided inaccurate details. NDTV has been in deep financial and legal soup for a while. In June 2015, SEBI had imposed a fine of Rs 2 crore on it for delayed disclosure to the stock exchanges about a Rs 450 crore tax demand in early 2014. Last year the Delhi High court The Delhi High Court had vacated a stay granted by the Income Tax Appellate Tribunal (ITAT) on the Rs 525 crore penalty on New Delhi Television Ltd (NDTV). In November 2015, the Enforcement Directorate had issued a show cause notice to NDTV bringing foreign investments of around Rs 2,030 crore. The ED was probing into the matter because it was alleged violation of Foreign Exchange Management Act (Fema) guidelines. The CBI had also conducted raids on NDTV in June last year for wrongful gains made by its promoters, the Roys. Even as NDTV is under probe for high-level Tax fraud and other financial irregularities, it is quite surprising that many Prominent Government officials and bureaucrats repeatedly choose NDTV to give interviews and ‘share their views’. 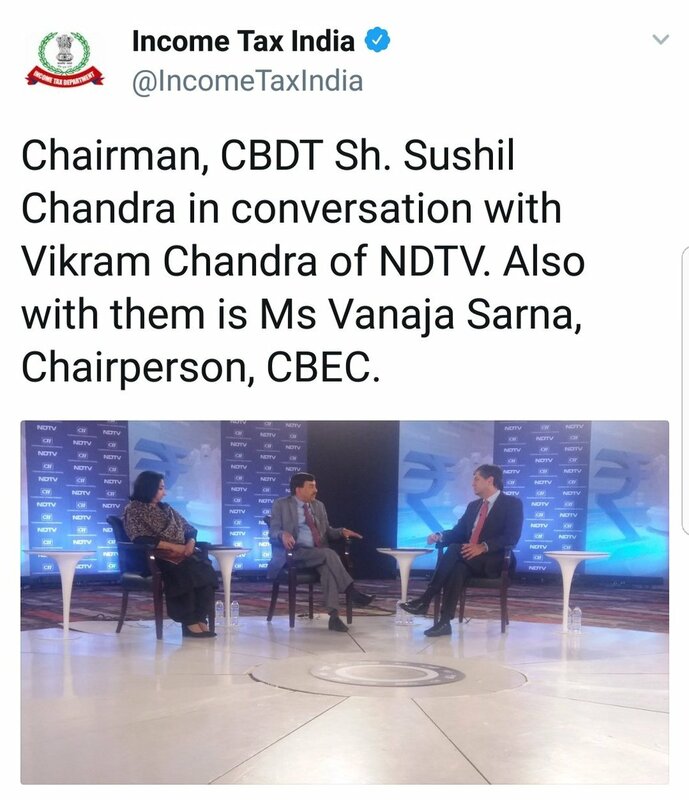 Just after the 436.8 fine was slapped, Chairman of CBDT Sushil Chandra was seen in an NDTV show. Even the Chief Economic Advisor Arvind Subramanian chose NDTV for an exclusive interview after the Economic Survey. Mr Subramanian’s appearance on NDTV was severely criticised by many stating that Chief Economic Advisor should not have chosen a channel tainted for tax fraud and irregularities for his appearance. It is widely being discussed that Government Ministers and bureaucrats should know better than to promote a channel that is being investigated by their own departments. Not only does it put the investigations under suspicion, it also raises questions on the part of the concerned people as to why they should go to such lengths to promote and publicise a channel that has its credentials under probe.